Every prestigious beauty counter is paying extra special attention to skin care, more importantly skin science. Last year the beauty market saw an influx of skin serums launch in the market so I have written a run down of what I believe the be the market leaders. These products are trying to manoeuvre their way into everybody’s daily skin care regime, as a necessity, by offering more benefits and innovations. Skin promises include: skin re-syncing; skin resurfacing, evening of pigmentation, with day, night and weekend options available. Although traditionally an expensive and luxury item due to their potent properties the masstige offerings are not to be ignored. Science: FOREVER YOUTH LIBERATOR is the first anti-ageing skincare containing the Glycanactif™ complex, a combination of 3 glycans, to help stimulate skin’s youthful capacities. USP: helps to correct the appearance of uneven skintone by acting on dark spots, uniformity, translucency, and radiance. I am excited about this product and its big promises. It has a opalescent sheen to it and a rich texture which dries quickly so you can continue with your make up regime. Leaves skin visibly tightened, plumped and dewy. 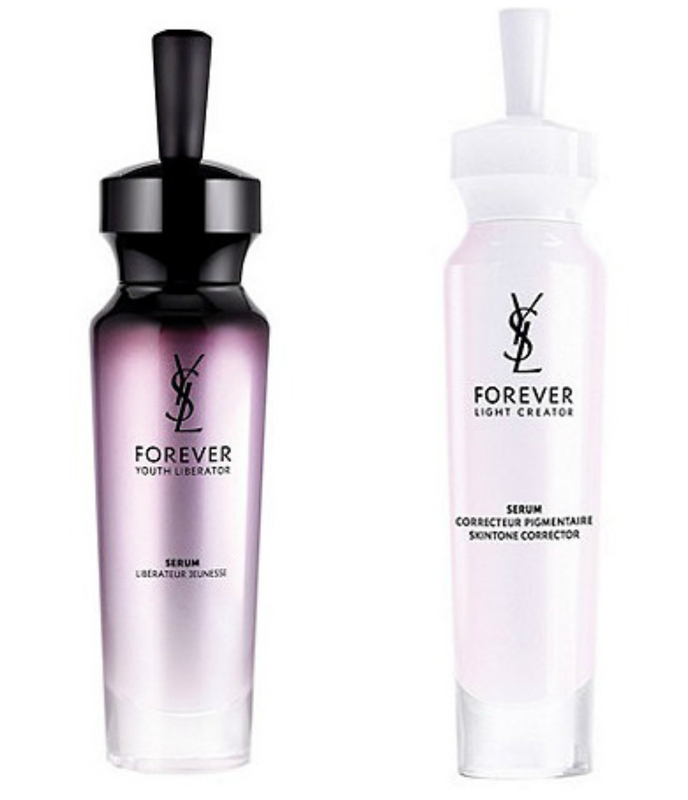 My facialist raised a concern with this product which I am inclined to agree with; primarily as a cosmetic brand she believes the YSL serums are primarily a cosmetic and a skin product second and the temporary results are, well, more temporary like your makeup. 3 COMPLEMENTARY SKINCARE PRODUCTS THAT RESTORE SKIN’S FUNDAMENTAL FUNCTIONS AND RESYNCHRONIZE ITS NATURAL RHYTHMS EVERY DAY. USP: 4 criteria’s to define exceptional skin quality: LUMINOSITY, PLUMPNESS, EVENNESS AND SMOOTHNESS. 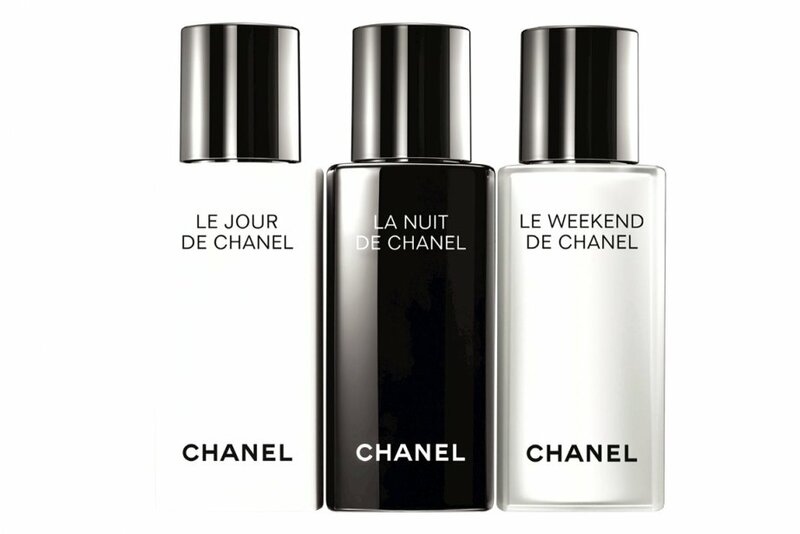 Marketing: Chanel are marketing the set as a tailored daily “Ritual” all women should take on so it looks its best no matter what environment your face experiences. There is something so chic and indulgent about using this set, the fragrances are typically haute-Chanel and there is something very decadent about using 3 serums on your face. The price tag alone is a commitment! I’d say I enjoyed using these serums the most because I love spoiling my myself when it comes to skin care, but it isn’t ideal for the busy working woman who favours a multipurpose product. However, if you do have the time you have 3 very good serums which produce great results and contains Salicylic acid and Glycoli acid which strips away the crap and indulgent and moisturizing elements like rose, jasmine and frankincense. Although they are marketed as a trio, if you can only afford the one I would recommend Le Jour as it has more restorative properties as well as plumping for the day ahead. Science: The new serum combines purification technology with cellular synchronization to maximise skin repair during sleep. This features two key technologies: catabolysis (purifying) and chronolux (natural synchronizing). USP: The new formula also includes anti-pollution technology, claimed to aid in reducing the appearance of visible damage caused by environmental factors, as well as antioxidant and hyaluronic acid to provide hydration. Marketing: Estee Lauder has created a digital roll out for this innovative product by placing interactive ipads in store for shoppers to use which has brought the brand to the forefront of the digital beauty trend. I do like this serum and I believe it does what is says on the bottle. Every night I used it I woke up looking “well-rested” and dewy and my makeup went on flawlessly as my skin felt well rested and prepped for the day ahead. the texture is similar to YSL serum, silky to apply but not as fast drying. For me, and this is a purely aesthetic thing, Estee Lauder has never interested nor spoken to me as a brand, that’s not a reflection on this product, because it is good, but there’s something a bit dated about their offerings. Not excited. 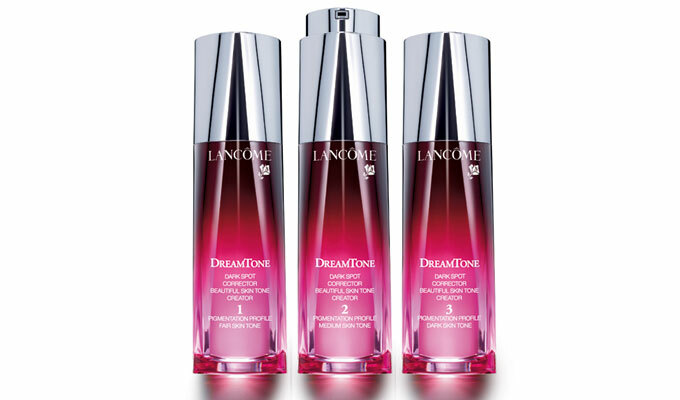 Lancôme carried out research in China, The USA and France to find that wrinkles weren’t the primary issue when it came to skin worries; the main concern was skin tone. This dark spot corrector is designed to correct the appearance of dark spots, uneven skin tone, and visibly corrects colour irregularities such as dullness, sallowness and blemish marks. USP: 3 different formulas for different skin tones: light, medium and dark. At 25 pigmentation isn’t a primary concern for me. I do enjoy the idea of separating out the serums into skin tones as it is common knowledge that different skin tones have different concerns. the idea is innovative but I’m going have to age a few decades before I comment on this one. Apparently sun worshiper Kate Middleton is a fan and if you like your beach holidays this could be the one for you. If you have tried Lancome, Advanced Night Repair I would be interested in hearing your thoughts in the comment box below. 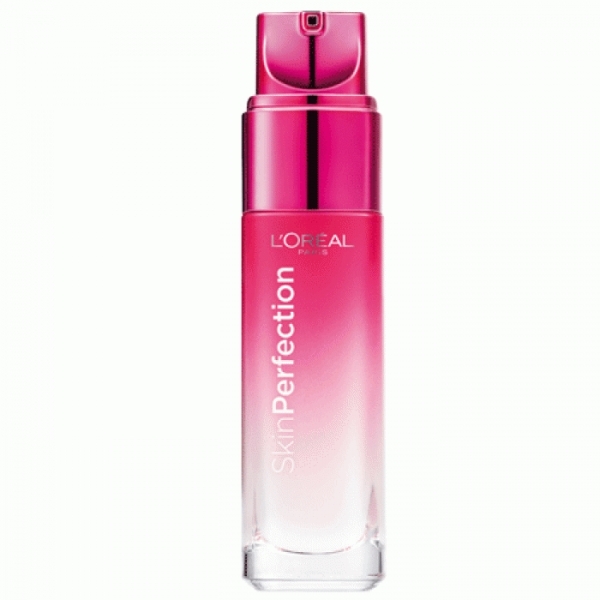 Science: A powerful formula enriched with Perline-P and patented LR 2412, helps transform the appearance of skin quality. USP: Pore minimising, more even tone, skin texture feels silky-soft caused by stress, fatigue and an unbalanced lifestyle can affect skin quality causing the satin-touch serum helps boost hydration and refine skin texture. Marketing: “A promise to pixel perfect your complexion” Cheryl Cole fronts the campaign wearing no makeup. I am first and foremost impressed at the branding here – very relevant to its selfie obsessed target audience. In an age where we are constantly photographed, marketing jargon; “pixel perfect”, speaks to young women who are avid users of social apps like Instagram, Facebook and Twitter. The pixel perfect tagline parallel’s the popularity of filters on photos to create flawless glowing faces. This product would benefit from a smart 360 digital campaign to follow through on the “Pixel Perfect” strapline. 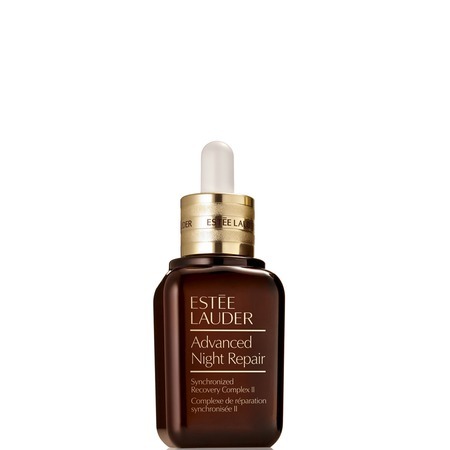 My sisters uses this product, after downgrading a price bracket from her Bobbi Brown serum, and reports she is really impressed with the results and would not pay the additional £40 she was paying out previously. She reports an even skin tone and a prepped base for her morning moisturising and makeup application. My sister is also an Air Hostess for BA so needs a reliable serum in order to prep her skin for the dehydration she experiences during long-haul flights.